Great variety of colors and size great for can be used a variety of different festival occasions such as Christmas and Easter. I really wanted to use these- so I decided to make an owl. Using these as his wings and some of the 64424 assorted card pack for his main body. I decided to make him a bit brighter and more festive using 69987 glitter. The main body was a empty toilet roll. Excite their senses and help them create the most impressive masterpieces with these Feathers Small Spot 7g Bag. A great resource for any busy nursery or primary school, this large and economical pack comes pre-sealed for easy storage until required. 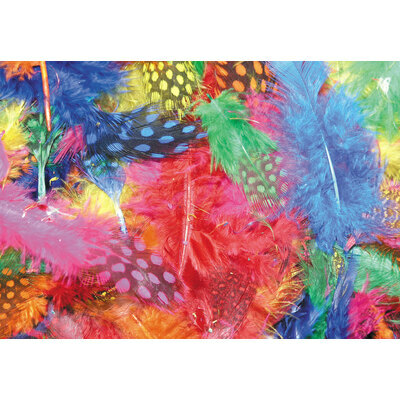 Inside, an assortment of brightly coloured, spotted feathers are provides - great for gluing on to most fabric and paper types while also working perfectly in sensory corners. Suitable for use by all ages, these engaging feathers promise to excite and inspire every single one of your pupils - creating the most engaging arts and crafts sessions of the year. Here at Gompels, we have a wide range of crafting resources for all environments from our Assorted Buttons and Assorted Ribbons through to our large Craft Compendium. All our products are available online here and for exceptional wholesale prices.